The Northumberland Arms Community Pub's own web site tells us that it had served the community as a traditional local pub since 1824, its multi room layout giving it a unique character and a warm welcoming atmosphere. As the late Jack Turnbull said in his classic book on the pubs of Marple, Compstall, Mellor and High Lane, Last Orders Please, "If you like a pub with an intimate and friendly atmosphere around a cosy bar and a good game of darts with the locals, try this one." 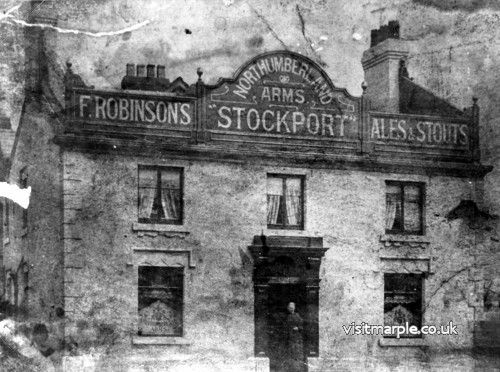 A very early photo of the Northumberland Arms on Compstall Road. When local residents learned that Robinsons did not plan to seek a new tennant following the retirement of long serving landlord Geoff Tarbatt, they formed a group and sought to register the Thumb as an Asset of Community Value. This was successful and gave enthusiastic volunteers the time they needed to form a Community Benefit Society - The Northumberland Arms Community Society Ltd - giving them the chance to purchase and run it as a Community owned pub. After several public meetings, and what must have been a huge amount of work behind the scenes, the Society launched its Share Offer in August 2017. With a daunting target of £296,000 to raise, and as the initial share closure of 17 September approached, this was starting to look like it might be a tall order. The closure date was extended to 30 September to align with the Society's On-line Crowdfunding Appeal but still went to the wire and kept everyone guessing as to wether it would be achieved. When the dust had settled, it showed that the extension and the hard push at the end had just tipped them past the target by a bit more than £2,000. As well as local support, the fundraising success included some significant contributions of £100,000 from Big Society Capital and £25,000 from Cooperative and Community Finance. The Northumberland Arms in more recent times. The latest news is that the Society completed the purchase of the Northumberland Arms on Friday 10th November - in their own words, "lock, stock and with plenty of room for barrels!" They started a minor pre-Christmas refurbishment and have been working towards a re-opening of 4pm on Saturday 16th December 2017. More details will be published when available. The Society is also in the process of generating share certificates, and have said they will endeavour to get these posted out to share-holders soon. There is a tremendous amount of work to do in the intervening period to get things ready, and with that in mind the Society is looking for volunteers from within their cohort of shareholders. They've had lots of messages via social media expressing a wish to get involved, so if you do want to lend a hand in the preparations on a voluntary basis, please get in touch via their web site contact page with some brief details of what you’d like to help with, whether you have any particular skills or expertise they can draw upon, your availability and your contact telephone number, and the Thumb Team will be in touch. Volunteers willing to set up and run various groups and activities are also more than welcome! They are of course also in the process of hiring part time and full-time staff, so if you or anyone you know are looking for paid work at The Northumberland Arms, get in touch too. Colour photograph of the Thumb - Northumberland Arms Community Society. Historic Image: The Marple Website Virtual History Tour (Compstall Album).